Refocus your marketing efforts with Zopim. 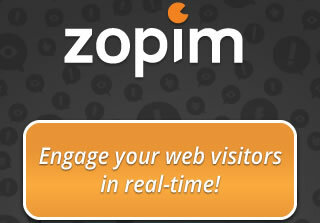 Zopim allows you to contour to your visitors needs! We apologize; due to the inadequate support that we’ve received from Zopim, we’re unable to continue to provide their services. Please consider using alternative live chat systems. Ever needed a better way to engage with your customers? If so, Zopim Live Chat is the perfect answer to your woes. Zopim will not only provide you with your visitors browsing information, but will also provide you with vast amounts of additional information, such as location, language type, and much more! Take the guess work out of where your customers are from and what they are doing by using Zopim Live Chat. Zopim has a built in feature that provides you with exact information pertaining to what your visitors are viewing, and even where they are from, and what type of computer they are using! Whether you are looking at integrating Zopim into your website or simply trying to make it work with a third party application, the process is extremely simple and extremely well documented. Don't forget, if you get stuck, you'll always get a reply to your query in minutes! Running a business can be a complicated affair if you're the only one. To tackle this problem Zopim came up with an innovative solution, which to allow you to be able to receive live chats from any device or computer, regardless of where you are, providing you with full mobility. Choose the language that suits your needs, with over thirty different languages to choose from, you can rest assured that you'll always be able to communicate in the language that you and your clients prefer. Don't worry, there are always new languages being added too, just in case you are wanting to expand into a new market!